At the ongoing Apple event today, the company has announced refreshed variants of its MacBook Pro laptops. The biggest addition here to both its 13- and 15-inch variants are the inclusion of Intel’s latest 4th-gen Haswell processors, as well as the new Intel Iris integrated graphics. The new MacBook Pro laptops retain their Retina displays, and as usual are thinner and lighter than its predecessors. The MBP 13, for example, is now a mere 1.8cm thick and weighs 1.57kg. The MBP 15 shares the same thickness as its little 13-inch brother, but weighs about 0.5kg more. Underneath, both the MBP 13 and 15 are equipped with Intel Haswell processors, while the MBP 15 gets the more powerful Intel Iris Pro integrated graphics and a dedicated NVIDIA GT750M GPU. The MBP 13 only packs the standard Intel Iris integrated graphics card. Connectivity wise, both MacBook Pros sport two Thunderbolt 2 ports, two USB 3.0 ports, HDMI-out and a microSDXC card slot. Also, both laptops can be configured to pack up to 512GB SSDs and 16GB of RAM. Finally, the integrated battery is good for 9 hours of use on the MBP 13, and 8 hours on the MBP 15. Both the MacBook Pro 13 and 15 will run on the new OS X Mavericks, and is available now at the Malaysian Apple Online Store. 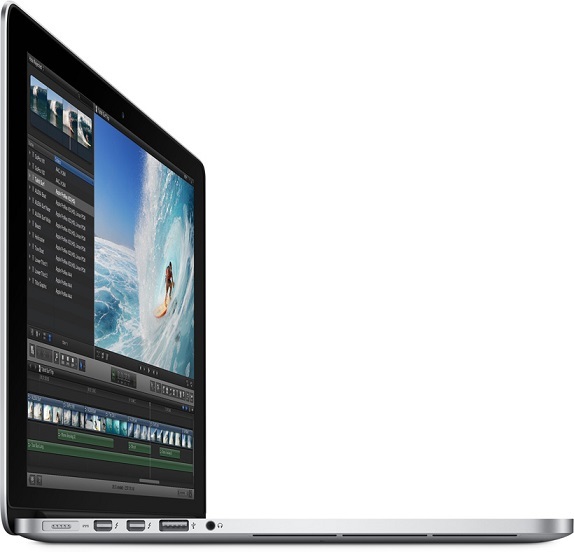 Prices for the MBP 13 start from RM4199, while the MBP 15 is retailing from a cool RM6499. For more information about the new Macbook Pro laptops, head on to Apple’s official product page here.